Back in the dark ages we had Pet Rocks. (no, really, look it up) It was an amusing spoof of traditional pets, conceived in 1975 by Gary Dahl. The rock part was simple, it was the "owner's manual" that was hilarious and genius. Then there are zen gardens, in which you rake sand and put rocks in artistic places and try to sit still, kick the hamster of modern insanity off the wheel and Contemplate The Universe. Take clue pic of rock if not at a park. Take pic of rocks found. Post to the group written on rocks. It's like that Pokemon thing, only with stone age technology. You get outside, in a park, and go on a treasure hunt. Sort of like geocaching, only simpler, and without maps and compasses and GPS and Maui as Navigator. 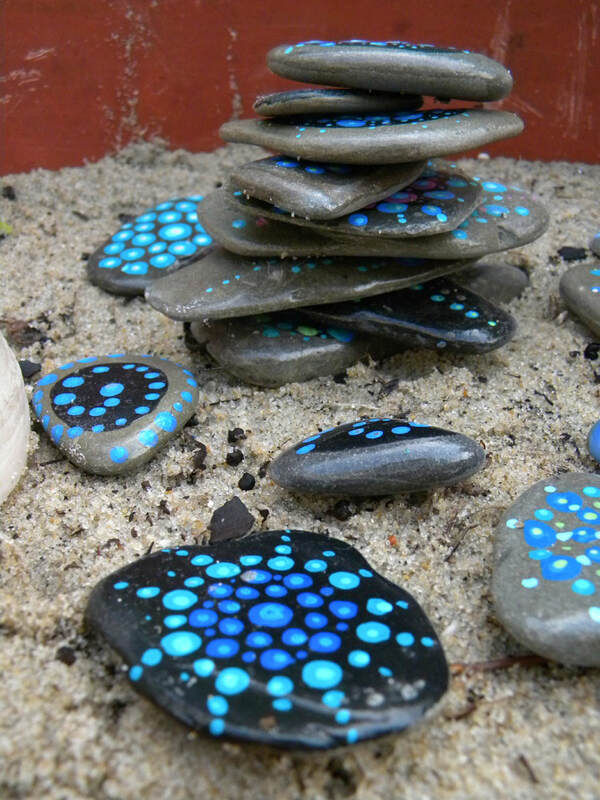 Painting your own rocks requires only the artistic talent inherent in your human DNA. We all have the basic Gene Of Creativity. You don't have to be Michelangelo (or any of the other ninja turtles). Find rocks. Not just any rock; smooth, round, water worn rocks work best. Streams, lakes, beaches are great places to find them. I find a lot kayaking in the Chesapeake Bay area; the sandy tidal waters roll and tumble rocks until they are like eggs or pancakes. A smooth surface is easier to paint, but you can prime your rock with a layer of paint. If doing mandalas, a circle of dark color behind your dots brings out their color. You can also find rocks at craft stores and plant nurseries and hardware stores: anywhere they sell landscaping stones. Some folks ignore the smooth stone rule and just use the lumpy ones. Be careful that you are collecting from a place that allows it, some parks do not allow collecting, even of rocks! Lose rocks. Place your painted rock somewhere it can be found. National and State Parks frown on this, they want their parks to remain natural. While your rocks are lovely, they will be considered "littering". Towns, trails, stores and other places seem to be fine. Remember, you are not so much hiding it as placing it so it is a surprise for someone, perhaps an inspiration for their day! Use basic acrylic craft paint. It is opaque and will cover things. Artists' acrylics are translucent and mix into beautiful glowing colorscapes, but don't cover objects well. There are fancy kinds of craft acrylic like multi-surface and enamels and outdoor paints which can be used on difficult surfaces like glass, plastic or metal. You bake them onto glass or metal (it works very well) or allow the paint to cure for 1 to 3 weeks. If you don't have the patience for that, spend less money and get the regular acrylic paint (no multi-surface or enamels) for cheaper, it dries in minutes (help it with a hair dryer set on nuclear blast). Americana (Deco-Art) and Folk Art are fabulous (I've used them). Many people also swear by Ceramcoat (it is NOT Creamcoat, it is pronounced ser-am-coat, as in ceramics). USE A GOOD CRAFT PAINT: not the cheap stuff. Americana or Folk Art are dense, rich in pigment, one coat and done... especially when doing mandalas (the dot thing) you NEED to only do it once. Cheap paints will, 48 coats later, have you conversing like a mariner... you can also try leftover latex house paint. It is also designed to cover objects... like walls. Acrylic is basically indestructible but, a coating of gloss ModPodge will protect it further and bring out the natural color of the rock. It is NOT pronounced Modge Podge... it is MOD Podge. It's a 70s thing. Brushes: natural hair brushes are limp, floppy, and the hairs fall out, unless it costs $50. Nylon and taklon brushes are cheap at craft stores and last forever. They keep their points and the paint flows nicely from them. You are usually better off getting a couple nice brushes rather than the set of 25, most of which are chipmunk toothbrushes. Palettes: egg cartons, those little round things from the craft store, plastic lids, old muffin pans from the thrift shop, stuff from the recycling bin... you can keep using them, when the acrylic paint dries, you can put more over top and keep painting. Mandalas are easy to start, and you can paint for ages perfecting the techniques. There are like 4619723469183 youtube videos on how to do it. Basically use a tiny brush, q-tip, stick, twig, toothpick, Toothless (hey, bring that dragon claw over here), or other pointy object to get a drop of paint and lower...it....carefully...onto....the....rock. It should land in a nice round dome. Start at the center of the rock with 3 or 4 or 5 dots, and work your way out. When the first layer is dry, add another dot of another color on top... this dot is smaller so the first color shows. Paint a simple picture. Your rock probably has room for a mermaid or a Pokemon, but not a whole landscape... or does it? Think tiny. Use little pointy brushes.